After years of advocacy, a successful pilot project, and the unanimous approval of neighborhood organizations, a resolution for making the protected bike lanes on JFK and Market Streets permanent, was introduced on Thursday. The resolution has been transmitted to City Council. As those who read this blog and follow the Bicycle Coalition’s advocacy already know, the work to get JFK and Market introduced as a pilot project began in 2011 and was led in part by Center City District, the Streets Department, OTIS, cyclists and people who live and work along these Center City streets. 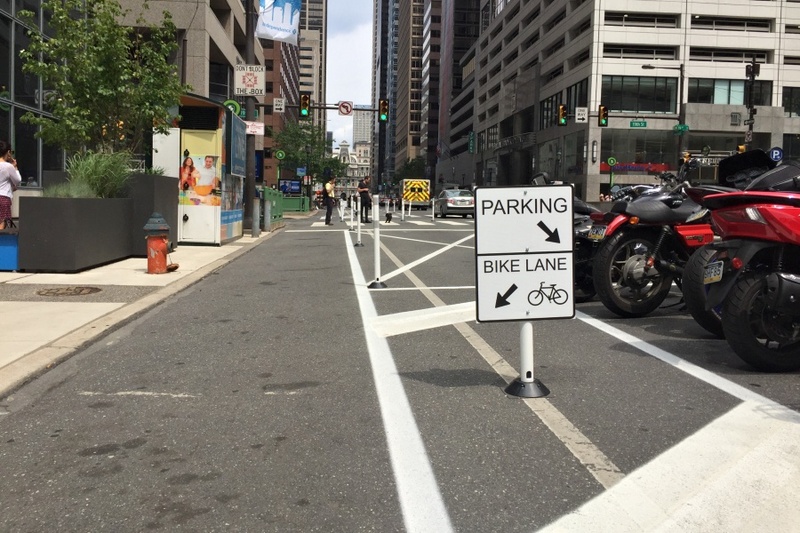 The JFK and Market Street bike lanes were installed as a 9-month pilot project in June 2018. Since then, cycling has seen huge advances on those streets in Center City, and pedestrians have commented, when surveyed, that the shorter crossing distances make the street safer. These streets have also seen Philadelphia’s first bike traffic signal, which help explain to cyclists when it’s safe to cross through the intersection at 16th Street. Earlier this month, the Logan Square Neighborhood Association and the Center City Residents Association voted—unanimously—to support these protected bike lanes and make them permanent in their neighborhoods. The residences along JFK and Market also supported making the lanes permanent. Center City District, additionally, received positive feedback from business owners and those who work and live along the corridor, in a survey. Actually introducing legislation to make the lanes permanent is now in City Council’s hands. Given the satisfaction of the lanes in general, the safety workers and residents feel when crossing the street, and the agreement that these lanes are working as intended, we do not see any reason City Council wouldn’t introduce, and pass, an ordinance keeping JFK and Market Streets as they are currently.